Pourer of drinks at Broken Spanish. 1050 S Flower St - DTLA. Chances are if you know anything about the top dining scene in DTLA, you've heard of Broken Spanish. Chef Ray Garcia's Downtown jewel is one of the top-rated restaurants in the area and with reason. The food deserves all the praise it gets, but since it is time for Bartender of the Month, we'd like to shine the light on barman Ken. We met Ken during one of our many visits to Broken Spanish. Each and every time he made us feel like his attention was solely ours, yet he was shakin' and pouring drinks for everyone involved at the bar. Despite how fresh he is to the bar scene (two years) he has already been recruited by Broken Spanish and 71 Above; that's two of the top dining selections in DTLA ladies and gents. He has mastered the cocktail menu curated by bar manager Chris, and you can taste the heart and soul he puts into it. It was a no-brainer to give him this month's honor of Bartender of the Month. We got to sit down with Ken over Margaritas and Mezcal infused cocktails. 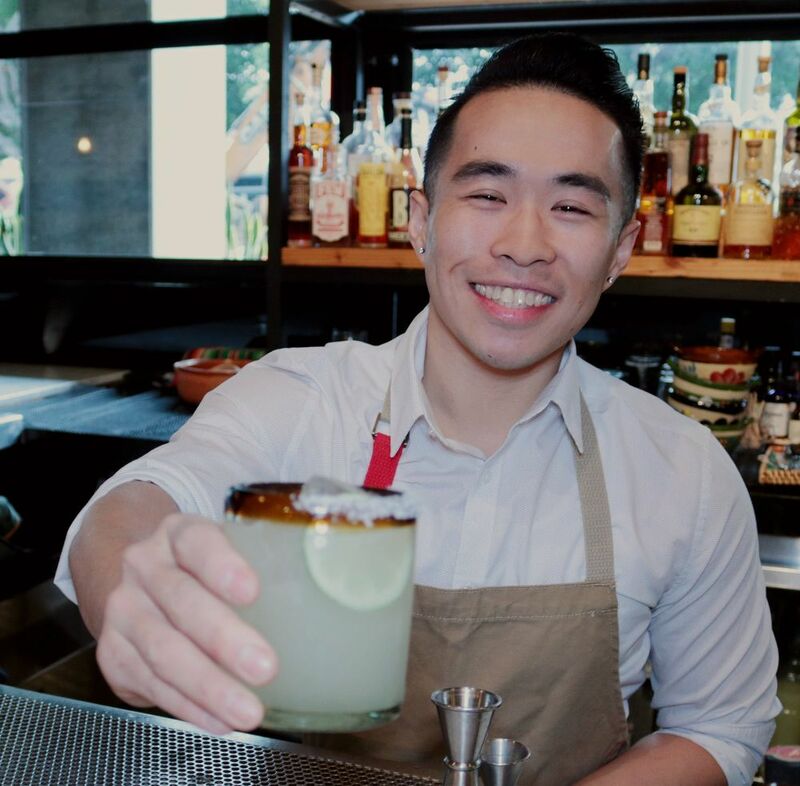 He shared how bartending literally changed his life in a short amount of time, and why he is ready for the future, thanks to his awesome mentor. HHC: Where were you born? HHC: Where do you currently reside? HHC: How long have you been a bartender? HHC: When did you know you wanted to be a bartender? KL: After three long years pursuing a business marketing career, I came to a fork in the road. I had to decide whether to continue and try to climb the corporate ladder or do something I can really be excited about. A friend suggested I try my hand at bartending. I thought it was a crazy idea, but I was ready to do something crazy. I dove right in, and two years later, I never looked back. I feel like even my worst day behind the bar beats the best day behind a desk. HHC: What’s your favorite drink to make? KL: I want to say anything with egg whites. It’s always an eye-catcher, but lately, I find myself falling in love with Mai-Tais. It’s so boozy and tasty. HHC: What’s your favorite drink to drink? KL: Can I say mai-tais again? If not that, then my go-to is a shot of mezcal and a fruity beer, like the steigl grapefruit radler. HHC: What is a must have at every bar you go to/work at? KL: Fresh juice. it’s so important. It can make or break your drink. HHC: What is your favorite type of bar? Why? KL: I don’t know if I have a specific favorite type of bar. It’s all very situational, but I gravitate towards bars that [have] an atmosphere that is conducive to conversations. I don’t want us to be shouting at each other over the music. Then again, do we want to let loose and go dance? That’s cool too, lets do that. HHC: Where is your favorite bar? Why? KL: I have a soft spot for Everson Royce Bar. Their staff is super friendly and they have like, the best burger ever. Also it’s at ERB that I discovered my love for the mezcal + steigl radler boilermaker. HHC: What kind of typical bar regular do you like? KL: It’s going to sound cliche, but just someone who’s friendly. I’m notoriously bad at remembering names, but I'm pretty good at remembering faces. So if I remember your face and your name? Chances are we had a pretty good time together last time you visited. HHC: Do you know any bar tricks? KL: Nope. One time I tried flipping a bottle, and there was not a second time. HHC: How did you end up working where you are now? KL: My mentor asked if I was interested in working with him, and I said yes. HHC: Where do you see yourself in five years? KL: That’s a very good question. HHC: Have you ever invented any drinks? HHC: Who was/is your mentor/idol if you had one? KL: Darwin Pornel has been my mentor behind the bar virtually since I started this whole bartending thing. Can I say hi on this? Hi friend. HHC: Where do you go for Happy Hour? KL: I wish I had time to go to happy hour. HHC: What’s one thing you think it takes to be a good bartender? KL: Attention to detail. it’s the little things that really count. HHC: What’s the craziest thing that has ever happened to you on the job? KL: No, nothing crazy has happened to me on the job. Nothing...yet. We'd like to thank Ken and Broken Spanish for letting us interview, film, and shoot Ken, not once but twice, at work. Go get a drink from this gentleman at Broken Spanish during any hour.